Santa Barbara City Fire crews responded to a reported structure fire at the Marborg Recycling facility on North Quarantina Street shortly before 9pm Wednesday night. Upon arrival it was determined that the fire was seated in a large rubbish pile in the interior of the facility. Marborg employees operating heavy equipment aided 3 Engines, 1 Truck Company and a Battalion Chief. Smoke was visible throughout the lower Eastside. Firefighters using hose streams augmented by foam, applied water to the fire as the rubbish pile was pulled apart. The Recycling facility is sprinklered and the system was activated and flowing when fire units arrived. The fire was extinguished within 45 minutes and investigators remained on scene to determine the cause. 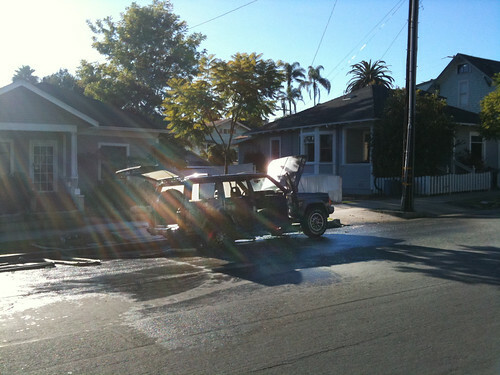 SANTA BARBARA, CA - The Santa Barbara City Fire Department responded to a report of a vehicle fire in the 100 block of Harbor Way at 5:02am this morning. Harbor Patrol units were first on scene and reported a vehicle fully involved with fire. Firefighters arrived shortly thereafter and due to exposures to nearby buildings requested a structure fire response. Firefighters extinguished the fire and kept exposure damage to a minimum. The vehicle is owned by the City Of Santa Barbara and is a complete loss. Another City vehicle also sustained minor damage from heat due to its proximity. The vehicles were parked approximately 5 feet from the Santa Barbara Maritime Museum. The Museum sustained minor exterior heat damage as well. There was no interior damage to the Museum. There were no reported injuries. Fire investigators believe the incident to be suspicious in nature and are continuing to investigate. City Admin Reorganization Expected to Save Santa Barbara City $200,000 Annually. SANTA BARBARA, CA – City Administrator Jim Armstrong is reorganizing the City Administrator’s Office effective January 1, 2010, following the departure of Assistant City Administrator Joan Kent. An annual cost savings of $200,000 will be achieved with current department heads assuming additional responsibilities. Administrative Services Director Marcelo A. López will be appointed as the new Assistant City Administrator – Administration. Mr. López will provide oversight for the Library and Finance Departments, and the Administrative Services Department. He will also coordinate the City’s involvement in the South Coast Youth Gang Task Force. He has worked for the City of Santa Barbara for 13 years. Prior work included serving as the Executive Director of the Employment and Economic Development Department in San Joaquin County and Deputy Director of the Employment and Training Department for the City of Stockton. Mr. López received a Bachelor’s degree in Political Science and Licenciado degree in Latin American Studies from the University of the Pacific. Community Development Director Paul Casey will be appointed as the new Assistant City Administrator – Community Development. Mr. Casey will oversee the Airport and Parks and Recreation Departments, and the Community Development Department. He will continue to direct Plan Santa Barbara, the City’s multi-year effort to update its General Plan. He has worked for the City of Santa Barbara for 12 years. He previously served the City of Santa Monica as the Assistant to the Director of Planning and Community Development, Senior Planner and Transportation Planner. Mr. Casey received his Bachelor’s degree in Economics from the University of California at Irvine and Master’s degree in Public Affairs from the University of Texas at Austin. With existing staff assuming more responsibilities, the reorganization will eliminate one senior executive position and generate a savings of over $200,000 annually. “I appreciate the willingness of our department heads and staff to take on additional roles and assignments to make our organization more efficient,” said Jim Armstrong. What initially got our attention was what sounded like a bomb exploding. From a block or so away, we could see a plume of white and black smoke, rising up over the rooftops. When we wandered out onto the street we could see firefighters doing battle with said cloud of smoke (pictured above with considerably less smoke). Waking closer, we watched with the neighbors as a well-dressed young bald guy (presumably he was bald before the flames) walked towards the firefighters with his keys in hand (so they could unlock the back hatch) of what we could finally see was a late 90's Jeep Cherokee. After a few more minutes of billowing smoke, tire explosions, and a cute female firefighter confidently shooting the thing with a big water hose, the fire was out. I spoke briefly with the driver of the car (the bald guy) and he said that it had been a family ranch car for years, and was threatening to die for quite some time. "I only had time to grab a few things and jump out because the fire started right underneath me". Though he was cheerful and happy to be safe, his hands were shaking a little.. "I didn't expect it to go out like this". Citizen commentators note: I will continue to do my best not make a pun using the name of the nearby corner store, 'La Bamba'. as you can see, there's not much Jeep left.